Good morning! I am very excited to share this giveaway with you today (I feel like I always say that...but it's always true). Today Amanda from Hungry Designs has a little something for you guys. But first, here is a little more about Amanda and Hungry Designs. Hungry Designs is the brainchild of Amanda Whitelaw, a designer and illustrator living in Australia. After studying Illustration & Printmaking at Art School in Scotland, Amanda returned to Australia and started creating handmade wearable art and accessories from doodles and drawings that she did. Years later, there are over 200 individual designs to peruse. From whimsy fairy tale themed pieces, to dinosaurs and jackalopes, there is something for everyone. Three people will win a $50 gift certificate to Hungry Designs. Visit Hungry Designs and tell me what you would choose if you win. 2. Like Hungry Designs on Facebook. 3. Follow Hungry Designs on Twitter. I will announce the winners on Thursday February 28th. Good luck! Awesome giveaway ladies! Thank you so much! I'll drop Amanda an email on Etsy now. I'd love to win the little gentleman owl in a tie found here; http://www.etsy.com/listing/101668752/owl-in-a-tie-laser-cut-wood-brooch?ref=cat_gallery_8 or the cheshire cat brooch found here; http://www.etsy.com/listing/101590322/cheshire-cat-alice-in-wonderland-laser?ref=cat_gallery_3. Wow, I'm loving their stuff... I'm so glad you had this giveaway, otherwise I might never have looked at their Etsy site! ohhh I fell in love with the Mounted Jackalope Rabbit!!! it's awesomeeeee!! I love this Polaroid brooch!!!! http://www.etsy.com/listing/101674762/retro-polaroid-1000-camera-laser-cut? I follow Amanda on Twitter! I am a bit conflicted about the mounted head brooches; I think I am opposed to mounted anything, but on the other hand... They're so nicely crafted. (the unicorn one!) I'll have to think about this some more. I LOVE those Disney tourist laser cuts - they would be perfect for me! What a wonderful giveaway! I'm loving the mounted jackaloupe! Such a beautiful shop! I've been drooling over the brooches in this shop for a while know but I keep coming back to the Black Mounted Unicorn Head Wall Hanging! ooooooo!!! I love Hungry Designs! sign me up!!! I LOVE her Margot Tenenbaum brooch!! I've had my eye on it for a while now!! I really love the Black Perspex Silhouette Laser Cut Brooch, it's so classy looking! I'd get the wolf shadow brooch, so awesome! Liked Hungry Designs on Facebook! I follow hungry designs on twitter!! Yay! I would totally pick the Saber Tooth Tiger pin! And on twitter as well. there is too much good stuff in her shop to choose from! i would probably end up with one of the animal mount brooches, or the shadow puppet ones! Oh I think I would get the Orange Fox Brooch and Mounted Dinosaur Triceratops Head Brooch. I liked Hungry Designs on Facebook. Surely if I win I would choose the Mounted Unicorn Head on Dark Wood Laser Cut Wood Brooch and the Retro Polaroid 1000 Camera Laser Cut Wood Brooch sooooo cute! I like them on fb as Manda Rave! i just love all of the silhouette inspired stuff..! I would probably choose, the diamonds, unicorn brooch, or the sugar skull hot air balloon, but there were so many others I liked as well. Its hard to choose! 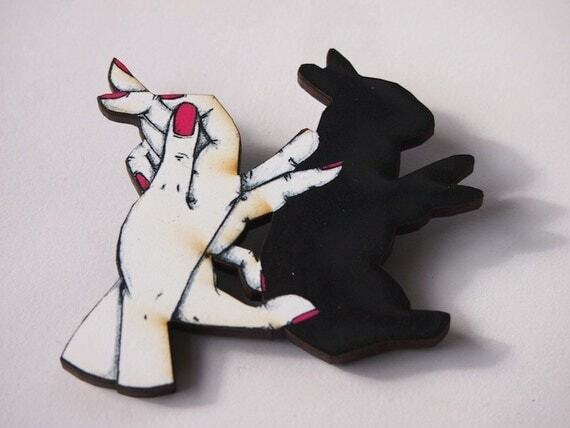 Bunny Rabbit Shadow Puppets with Pink Nails Laser Cut Wood Brooch --> I would wear the crap out of this one! And I liked Hungry Designs on Facebook! I LOVE HUNGRY DESIGNS. Amanda's work is amazing. I bought a bunch of postcards from her shop a few weeks ago and they are beautiful!! (Day of the dead Disney princesses, yeah, awesome!!) So this giveaway is just awesome. and I also "like" on facebook too!! I love Hungry Designs! My favourite pieces have always been the bunny shadow puppet (http://www.etsy.com/listing/107396215/bunny-rabbit-shadow-puppets-with-pink?) and the wood-mounted unicorn head (http://www.etsy.com/listing/101708762/mounted-unicorn-head-on-light-wood-laser?). What a great contest; thanks Elycia! I would choose the pink dangle earrings and paper doll brooch. I've liked Hungry Designs on Twitter. I've liked Hungry Designs on Facebook. I love the day of the dead cameo. I'd love for her to be mine. I love the unicorn head wall hanging! sinkingseas at gmail dot com. I love the mounted Jackalope head brooch! I also liked Hungry Designs on Facebook. I'm excited to see this giveaway because I've been looking on etsy for unique brooches I can wear to work and I had not seen her really cute shop! So even if I don't win I've found a great place, and if I do then I would love to have the mounted Jackalope brooch, the Owl in a tie, Rogue and Speech Bubble(my fav x-men character yay! ), or the Day of the Dead Cameo on heart wood piece, maybe the POW! comic one too... SO cute! The Pink and Green Gem Necklace is to die for! Thank you for the chance! Love the wolf shadow puppet broach! I would pick the Diamond Sugar Skull Laser Cut Wood Brooch! I would love to have the Mounted Jackalope Brooch! I am obsessed with cryptozoology and this may be the coolest brooch I've ever seen! I also liked Hungry Designs on Facebook! I love everything! I actually am waiting on a delivery from her Etsy store right now! Oooh...the 'Day of The Dead' skull cameo is right up my alley. :) Fingers crossed! I am loving the Mounted Jackalope Rabbit on Dark Wood Laser Cut Wood Brooch & the Illustrated Woodland Rabbit and Toadstools - Decorative Teacup and Biscuit Saucer in White Gold and Purple. So cute & unique! I have known about Hungry Designs for a little while now and been a 'liker' on the facebook page to follow the creation of her latest designs. Thanks for the creative fun! P.S. I love unicorns, too, but I would give it to my niece, 'cause I'm an amazing uncle. Heh-heh. I love that shadow puppet brooch, so adorable! If I won one of the gift certificates, I would totally buy the Retro Polaroid 1000 Camera Laser Cut Brooch :). Can never resist competitions though and being a poor student, this would certainly help to build my collection!! If I won I would buy one of the Mounted Saber Tooth Tigers http://www.etsy.com/listing/122615086/mounted-saber-tooth-tiger-cat-on-dark? and the Mounted Jackalope http://www.etsy.com/listing/120759511/mounted-jackalope-rabbit-on-dark-wood? Ooh, I might get a day of the dead cameo. I live in San Francisco's Mission neighborhood, where Dia de los Muertos is kind of a big deal. But I'd also be tempted to get the mounted unicorn hanging for a friend. I'm at missionamanda at gmail dot com! There are too many lovely things! But it would probably come down to the mounted unicorn brooch or the day of the dead cameo. I was just looking at this shop! Everything is so awesome! I love the unicorn brooch! That Day of the Dead Merida brooch is so rad. I love this set! http://www.etsy.com/listing/119045394/illustrated-woodland-rabbit-and? I really love the mounted saber tooth as well as the roller derby brooch. What a cute shop! This was an incredibly difficult choice because everything on that site is amazing. But If I win my top choice would be the Raw Wood Girl in Bow, so very cute. I also really liked the paper dress brooches and the perspex silhouettes. Great giveaway! The Ron Swanson and Ron Burgundy prints are wonderful and also the red baker mixer brooch is lovely! I love the mounted unicorn head brooch and the chatter phone brooch! So reminiscent of childhood. The Carousel Horse Brooch is my favorite!!! It is so pretty! I am so in love with the Mounted Jakalope Rabbit brooch! I would totally buy this! http://www.etsy.com/listing/101674664/retro-polaroid-camera-laser-cut-wood? I tweeted! https://twitter.com/_yesdeer/status/304453774133567488 Been DYING for some of these pins! My favorite is the Seven Deadly Sins Wrath Brooch! I love the Mounted Unicorn Head on Dark Wood Laser Cut Wood Brooch! I love unicorns and this would be a unique piece to wear out and about on a day when I'm feeling magical. Best way to contact me is julieanne [dot] mitchell [at] gmail [dot] com. I liked Hungry Designs on Facebook! I'd definitely get a brooch, they're so awesome! I like the retro gameboy brooch. I also LOVE the tea cup and saucer brooch. Ah. Hungry Designs has a wonderful Instagram feed as well! And I can't believe I wasn't following her on twitter until now - this has been rectified. It recently melted off (i was at laneway festival in 40deg heat), and I took it off my bag so that I wouldn't lose it. I felt lost without my baloon girl. When I glue-gunned her back together it felt like everything was right with the world. Like Hungry Designs on Facebook-annushka s.
I would love the triceratops brooch, being totally dinosaur obsessed. There are so many things I love! The Bear Shadow puppet brooch, the grey bunny one, the viewmaster!, the clouds... to name a few. i want the wolf shadow puppet broach! Just got one of her day of the dead ones and i love it! I would choose a Mounted Jackalope Rabbit on Light Wood Laser Cut Wood Brooch! I would have to choose between the saber tooth tiger and the jackalope, or just get both! I want the triceratops brooch! I already LOVE them on Facebook! I already follow them on twitter! Oh boy! What an awesome giveaway! That little watermelon eater looks so cute! P.S. Congrats on your pregnancy! Orange Fox Laser Cut Wood Brooch! Love the bear shadow puppet broach! It's so cute!! The wolf shadow! If I won, I would gift it to my sister who loves wolves and art. Both in one - perfect! I would choose the mounted triceratops brooch. Or maybe the unicorn head wall hanging. These are rad! I have been dying for some cute silly faux taxidermy for the wall, so I would pick the unicorn mount! Also, I liked them on Facebook! Yay! What an awesome contest! Also, I liked Hungry Designs on Facebook! I love the Shadow Puppet brooches! I liked them on Facebook as well! Holy cow! I love the Mounted Deer head brooch! Fingers super duper crossed! I actually really like the rabbit brooch you have pictured above, or the red and blue octopus brooch. Such unique stuff! I love the shadow puppet and marionette pins! The unicorn! For sure! I've always wanted a wall-mounted one! The Mounted Jackalope Brooch is amazing! I tweeted (katemmeza), I would love to win the Red and Purple Octopus Brooch, Red Baker Mixer Brooch, or the Blue and Pink Gem Heart Necklace.